THINK SAFETY, TALK SAFETY: Is one tongue interlock switch acceptable for CAT 3? Is one tongue interlock switch acceptable for CAT 3? Category 3 is a very, if not the most, common risk level that appears in machine safety applications. The Category requires that a single fault cannot lead to a loss of the safety function. 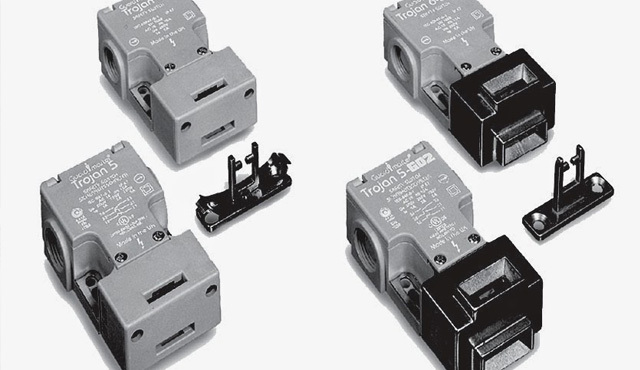 Many machines claim a Category 3 level with the use of 2 channels through one tongue interlock switch. However if the tongue was to mechanically fail, which is a single failure, this could lead to a loss of the safety function. This may be technically true but is it good design practice to use a single tongue interlock switch for a Category 3 system? Thankfully a new international standard, ISO 14119:2013, has been developed to give some more guidance. This standard will soon be adopted into the new revision of the AS 4024.1 series. This standard states that for risk levels equivalent to Category 4, it is not normally justifiable to exclude faults such as broken actuators. However for a risk level of Category 3 a full justification could be provided to exclude the fault of a broken actuator. The standard provides more guidance in Appendix G, where an example Category 3 system is shown. In this example two mechanically independent interlock switches are used to fulfill single fault requirements of Category 3. The standard also provides guidance on how to avoid intentional tampering/defeating of the safety devices. In Table 3 a tongue interlock switch is classed as a Type 2 device, this means the shape of tongue provides a low level of mechanical coding. Due to the coding only being low level, it is recommended to provide a second interlock switch to reduce the probability of the system being defeated. In conclusion, if a full fault exclusion is documented for the actuator failure ISO 14119:2013 does deem this acceptable for a Category 3 risk level. However I believe this new interlocking standard is recommending the use of a second mechanically independent device when using a tongue interlock switch for Category 3 or 4 systems, due to the single fault requirements and minimising the chance of defeat.